OK, I'll admit it, I have a few weaknesses. One is anything with caramel in it, another is pretty blouses, and another is cheap sunglasses. I've never even considered purchasing designer label sunglasses because I just know I'd break them or lose them or something. Right now all of my sunglasses sit on top of my water cooler. And every once in awhile one pair goes flying into the cat food dish below while the water is glug glug glugging out. 1) Depending on how many sunglasses you need to hold you might use different measurements, but I began by having a piece of wooden doweling cut 20.5" (51cm) long. 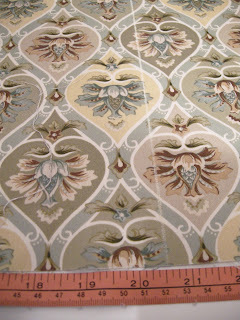 Then I cut my fabric, and backing, so that it measured 20.5" (52cm) X 10.5"(26.5cm). 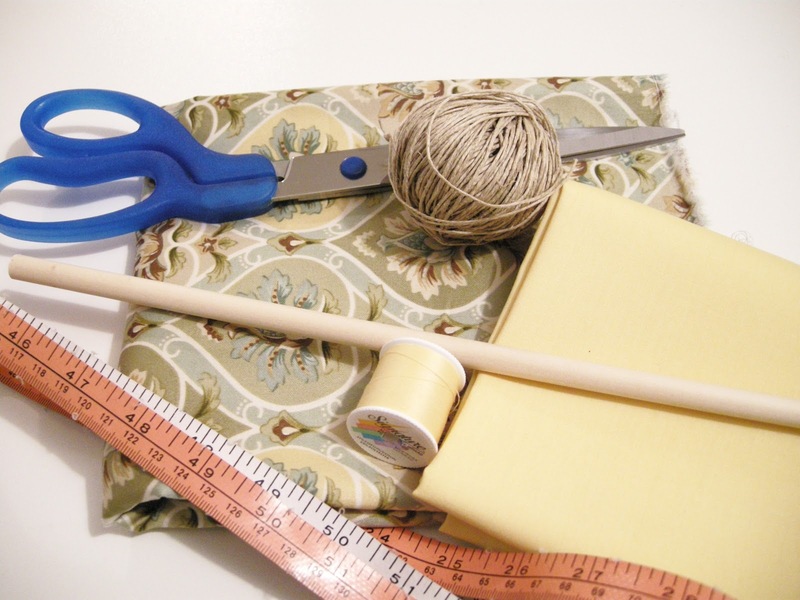 In the end you want your fabric to measure slightly narrower than your doweling rod. 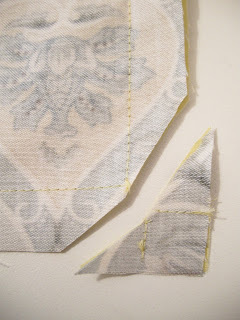 If you cut it the same length now, your seam allowances will take care of the rest for you. Quick note: It's not necessary to have a contrasting lining (backing). I just did that out of habit. No one will see the back of this, so use whatever you have handy. 2)Cut two pieces of elastic approximately 15"(38cm) long. 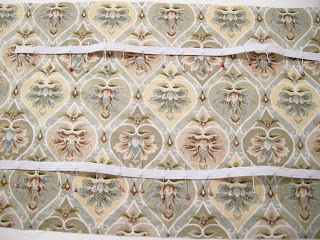 Attach to the front of your fabric approximately 2.5"(6.5cm) from each edge in two rows. If you're using a patterned fabric find something in the pattern to use as your guide to keep the elastic relatively straight. There should be a little bit of give to the elastic. It doesn't need to be stretched or lie completely flat. You'll want it to pucker when it's sewn down. 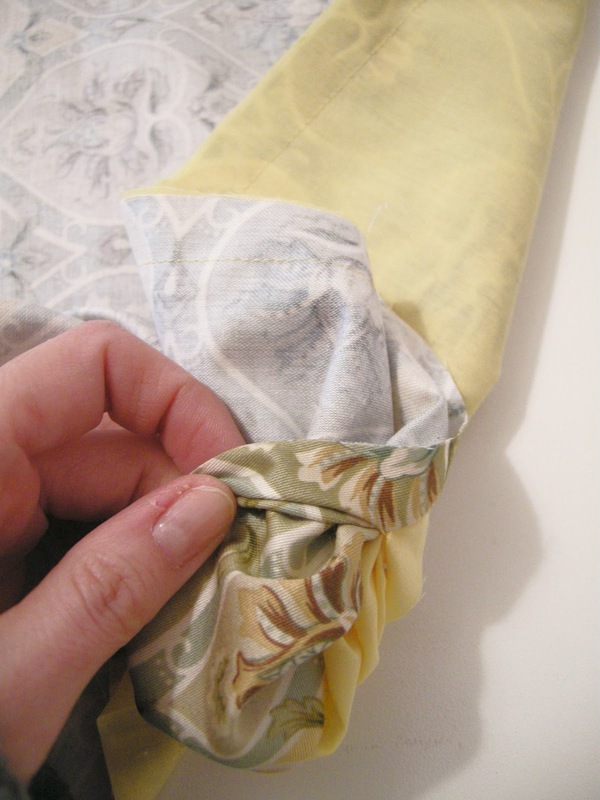 3)With pins, mark off all of the other spots along the elastic that you'll sew down to create little 'pockets' for the sunglass arm to slip into. To do this, I just divided the elastic in half and pinned it, divided those two pieces in half and pinned, etc. They're hard to see, but if you look closely you'll see all of the pins. 4)Now just do a quick stitch across the elastic everywhere you have a pin. 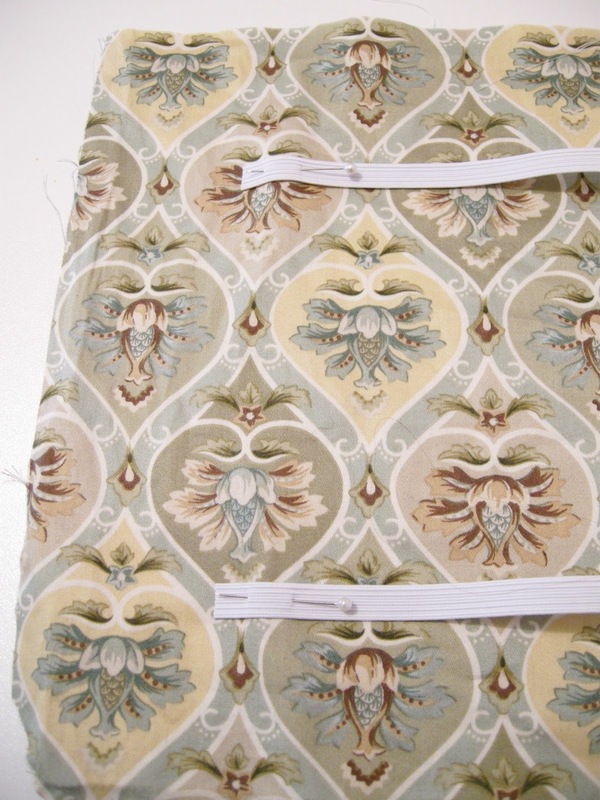 5)Now you can sew your front and back together along the top, bottom, and sides. 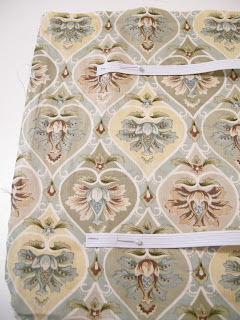 Stack your fabric right sides together and pin, making sure to leave a 1"(3cm) gap at the top to create a pocket for the wooden dowel and enough space along one side to turn everything inside out. 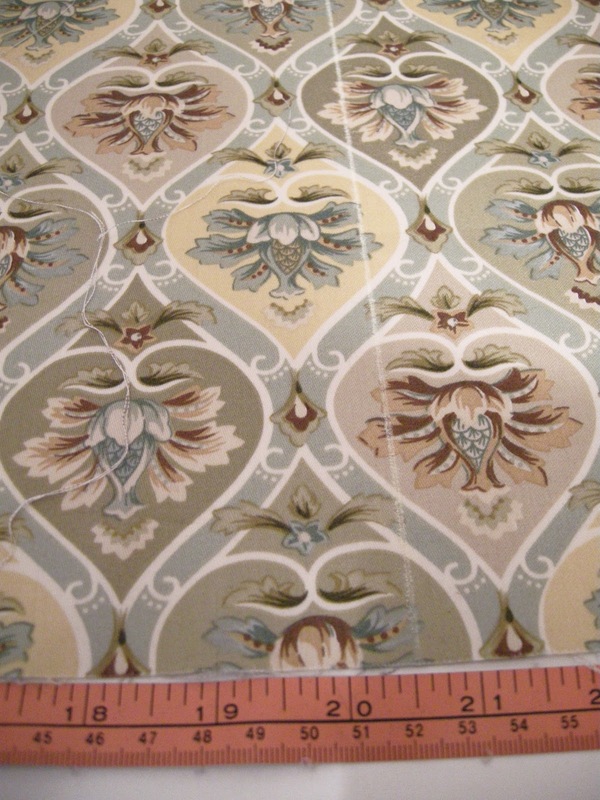 Use a 5/8" seam allowance. 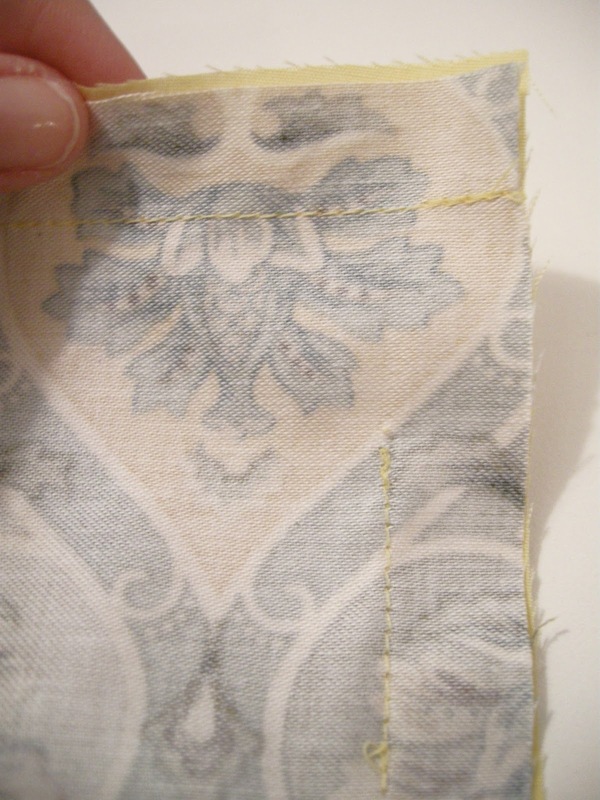 6)Make sure to cut your corners diagonally so that you get a nice clean corner when it's turned out. 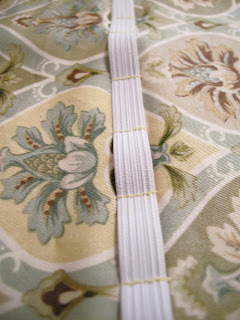 7)Turn your fabric out and slip stitch the hole in the side seam. 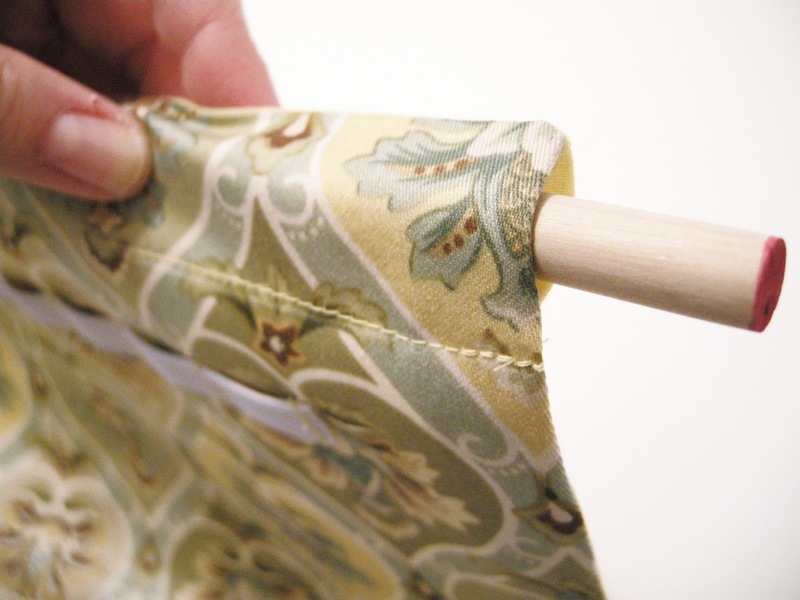 8)Stitch across the top, 1" (2.5cm) from the edge and insert your wooden dowel. 9) Almost done, you just need something to hang it with. 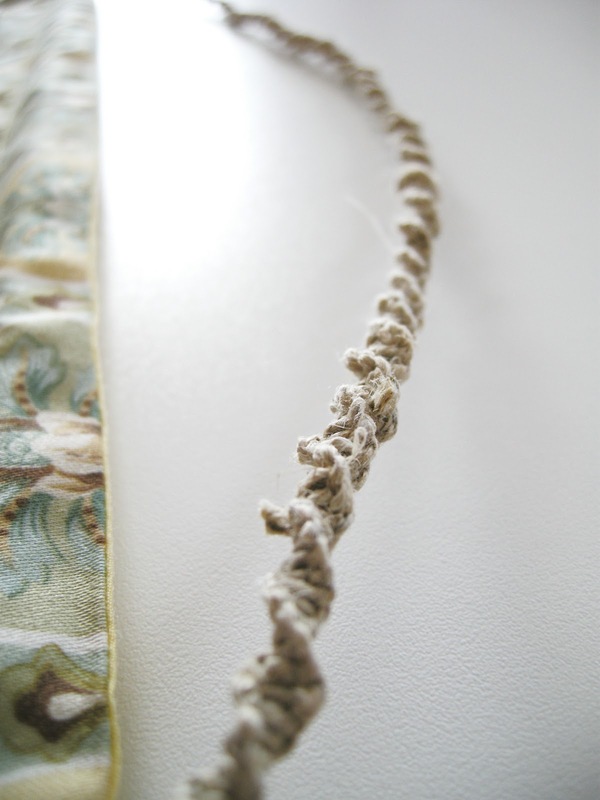 I used hemp twine and did a basic twisted square knot to jazz it up a bit. You can just use ribbon or cord without the macrame stitches and it'll still look just as cute. And what do you know...there's even room for more sunglasses!!!! I skipped the macrame steps but if you want me to show you how to do that just leave a comment below and if there's enough interest I'll do a separate post on easy macrame knots. Or, just leave a comment anyway and let me know what you think. Is this something that would be useful in your house? Maybe you could find other uses for it? Share your ideas below. As always, I'll be posting at all of the linky parties on the linky tab. your button on the Follow My Friends tab. You can see my first featured Friend from earlier this week here . WOW I so need one of these, My sunglasses are everywhere.. What a great Idea! One of my weaknesses is also sunglasses. I also buy the 10 20 $ ones because I want more than one pair. Awesome I LOVE it! Great idea!! I have way too many sunglasses that I can't keep up with; this would be perfect! What a lovely, lovely design. I was just visiting Lynn at the Vintage Nest and saw her butterfly project that she said you inspired. You mean I SHOULDN'T just throw them into my purse...? This is brilliant. Love it! Awesome idea! I totally understand the sunglasses addition, last time I went on vacation I bought three pairs! Great job with this project, following you from T2T Tuesdays. Pretty nifty little invention there! Thanks for sharing at Gettin' Krafty With It! 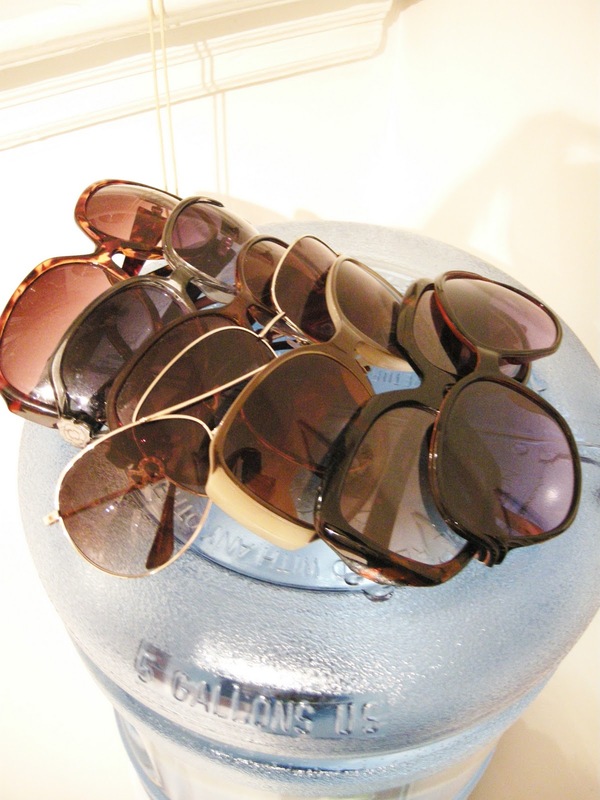 What a great storage solution for your awesome sunglass collection. Thanks for linking this up to Creative Juice Thursday! Oh, my gosh! How cute are you! I had no idea I needed one of these til I read about how yours can go flying off into the cat dish - too funny! I am adding this to my project list. This will be very handy as i have quite a few pairs, too, and need to be able to have them right by the door as I leave the house. Come visit me, too! What an awesome idea. As I was reading through this I was thinking that I'll need to make several. One for sunglasses, one for necklaces and one (perhaps without the elastic) for earrings. Can't wait to try it. Love it! I don't have as many sunglasses as you, but I have a big family! I used to have a similar hanging fabric with clear pockets for sunglasses, sunscreen, bug spray - and hung it in the garage just outside the door. 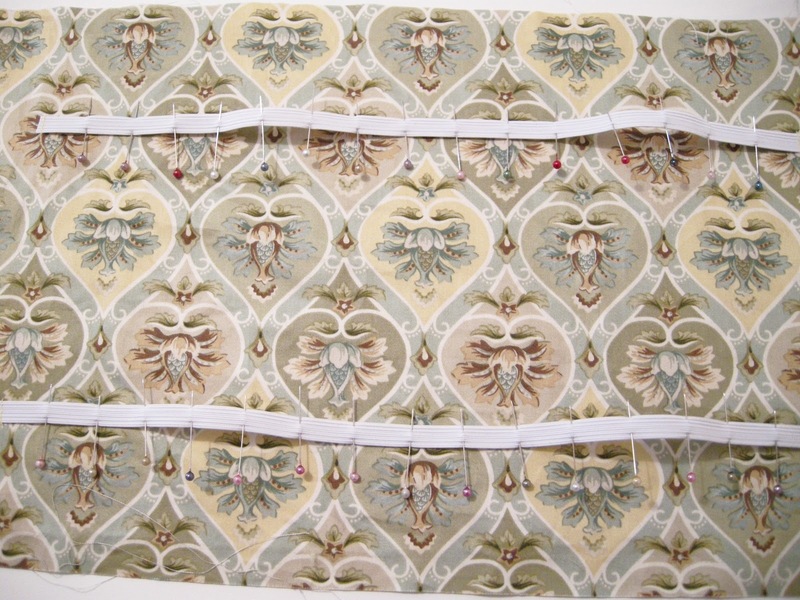 This motivates me to make a new one - love the use of the elastic! I'll admit it, I have a few weaknesses. One is anything with caramel in it, another is pretty blouses, and another is cheap sunglasses. I work for an optometrist and get designer sunglasses and glasses comped all the time. They are everywhere. Great idea. i am going to make this for my husband and self. we get our reading glasses at dollar store because we need different strenghts etc. this is perfect, need another pair, hang the ones you were wearing where the ones u take use to live. one row for his and one row for mine. thanks for sharing your talent with us! Thank you so much, this is a wonderful idea. My daughter & her family do triathlons & all have several pairs of sunnies, this will be great for the. I think I will make the one for the house & one for the car. Great work. 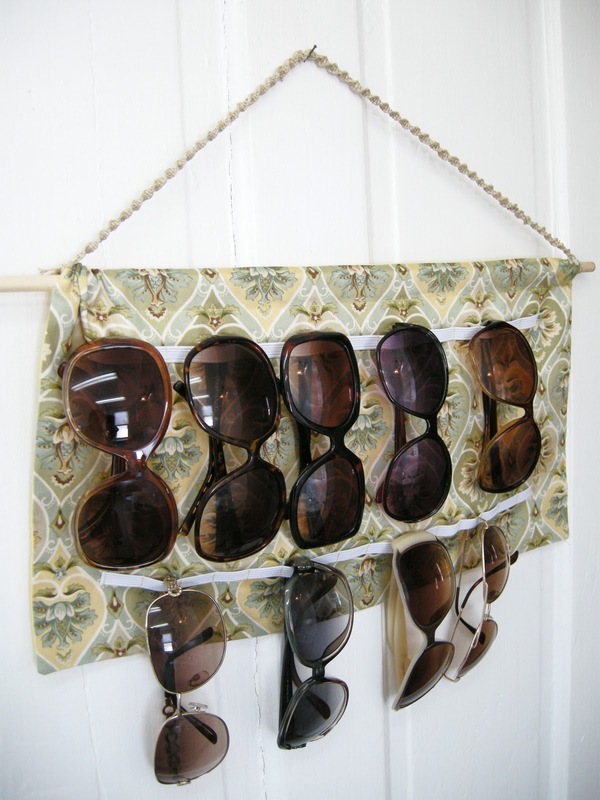 Love this idea...gonna make one for my vehicle for sure; that's where most of my sunglasses end up. I would love the directions for the macrame knot if you get time to post those. Thanks for your awesome imagination, skills and the decency to share with us.